Along the Ohlone Greenway, which I talked about in my previous post, one of my favorite spots to stop is the EcoHouse at Peralta and Hopkins streets (right next to the Karl Linn Community Garden). The Ecohouse is a demonstration home and gardens for a variety of green building and gardening techniques. There is always something to see there — vegetables and fruit growing in the permaculture garden, the ducks that eat bugs and swim around in a bathtub, the shed made of natural building materials. Recently, a greywater system was installed, the first permitted residential system in Berkeley. 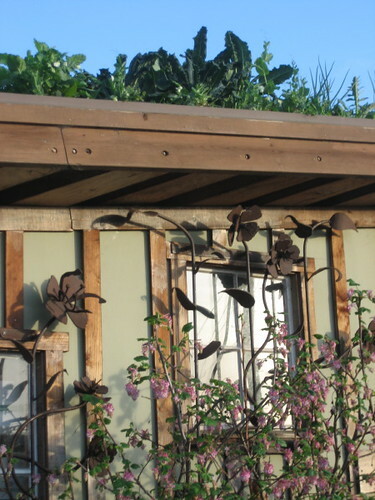 One of my favorite features of the EcoHouse, though, is the “living roof” on top of the garden shed. A few months ago, the roof was planted with vegetable seedlings that now appear to be providing a nice harvest of greens. The idea of “green roofs” or “living roofs” has been around for sometime, but it seems to be growing in popularity. I have seen new books out on the subject and various articles and academic papers as well. Green roofs vary, but they generally constitute plantings on some sort of structure, such as a shed, parking garage roof, or office building. They use light-weight planting mediums (so that the roof doesn’t collapse) and some sort of planting. I have seem examples of green roofs with low plantings such as sedums, and with native grasses, but not with vegetables, so this was a pleasant surprise. There was a series of workshops at the EcoHouse last fall, including one where the green roof was installed. I imagine there will be future classes there — the Ecology Center calendar is the best place to find out about such events. 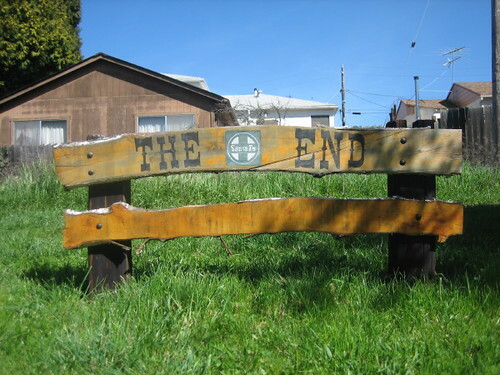 A walk past a community garden in the Bay Area is pleasant at any time of the year. Even in the middle of winter, the weather is mild enough for greens and root vegetables to survive and grow a bit. But fall is an especially fun time to see what is happening in the gardens. Pumpkins are still on the vine, tomatoes and peppers are making a final push, and some of the other vegetables are starting to die down to the ground. 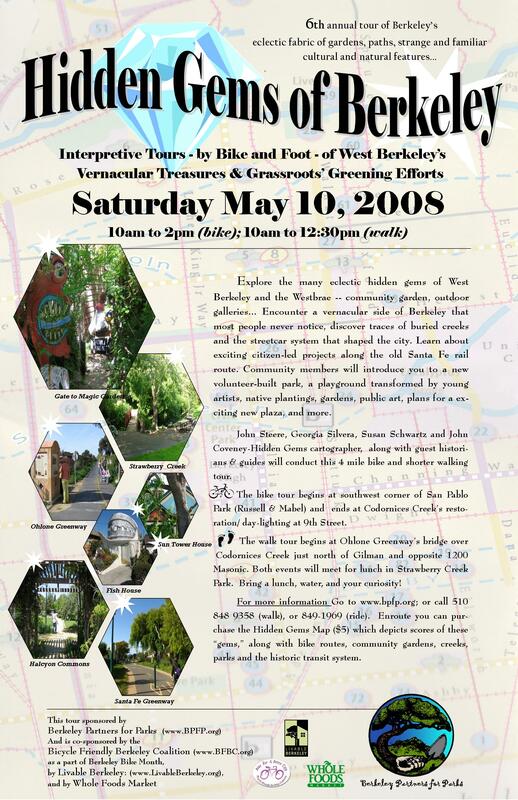 There are several community gardens in Berkeley, many of which are part of the Berkeley Community Gardening Collaborative. The gardens are open to the public for several hours each week, and most welcome volunteers at garden workdays. The once barren piece of land on the BART right-of-way at Hopkins and Peralta streets is now the site of a trio of community gardens — Peralta, Northside, and Karl Linn. Thanks to landscape architect and community activist Karl Linn (who passed away in 2005) and a host of volunteers, this land is now filled with vegetable plots, herbs, fruit trees, and native plants. 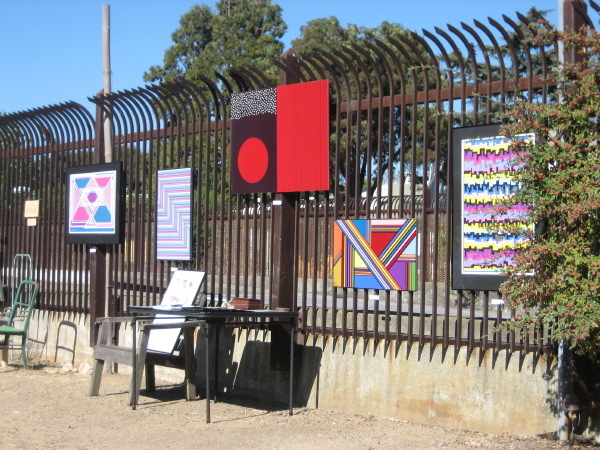 A 10th anniversary party was recently held at the Peralta Community Garden, which — in addition to garden plots and an herb and native plant circle — showcases a variety of sculpture, paintings, metalwork, and other pieces by local artists. The documentary film A Lot in Common tells the story of the garden. 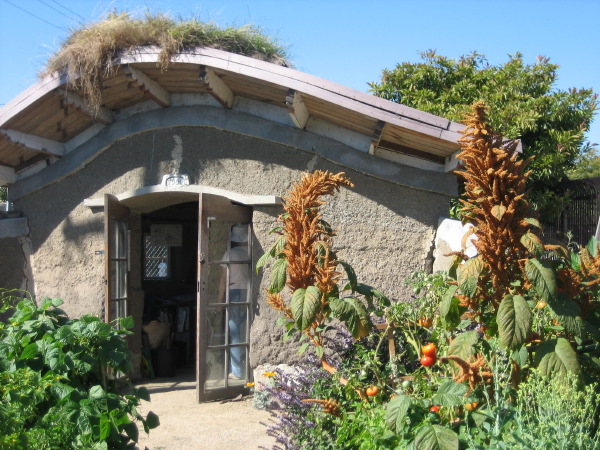 Connecting to Peralta is the Northside Garden, which features a beautiful straw bale toolshed. Across the street is the Karl Linn Garden and the EcoHouse, with a permaculture demonstration garden. And outside the gardens, California Habitats Indigenous Activists (CHIA) has been restoring a section of the Ohlone Greenway with local native plants.